Many analyses, such as chimerism testing, are often performed on small blood samples (e.g. pediatric samples). As a result, analysis of purified cell subsets requires techniques that can isolate more than one cell type from an undivided starting sample. Here we describe a method used by the Florida Tissue Typing Laboratory to sequentially isolate B cells, T cells, myeloid cells, and NK cells starting from a single sample of HetaSep™-treated blood for their chimerism analysis. Figure 1. Automated sequential separation of B cells, T cells, myeloid cells, and NK cells from a single sample of HetaSep™-treated blood. Figure 2. Purity of four different cell types isolated from 18 different samples using RoboSep™ sequential separation. Data kindly provided by Max Marschner, Supervisor, Florida Hospital Tissue Typing Lab. Why Use RoboSep™ for Sequential Isolation of Immune Cells? FAST AND EASY. 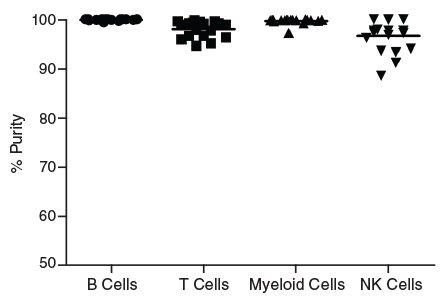 Up to four cell types can be isolated sequentially from a single sample. FULLY AUTOMATED. All isolations are performed during a single machine cycle with minimal “hands-on” time. NO CROSS-CONTAMINATION. Cells are handled with single-use disposable tips, never passing through reusable columns or tubing. HIGH PURITY. High cell purity and viability (>95%) with excellent recovery of desired cells can be achieved. EFFICIENT. Small volumes of blood (0.5 - 4.5 mL) yield sufficient cells to run DNA analysis or other downstream applications. 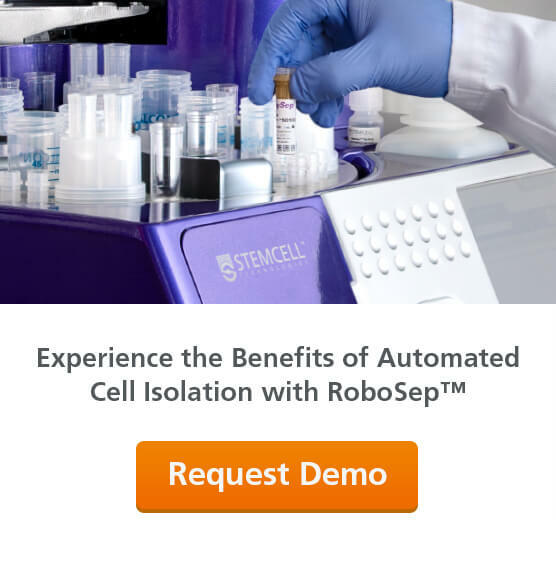 Streamline your cell isolations using RoboSep™ , the fully automated cell isolation platform. The RoboSep™-S and RoboSep™-16 instruments offer true walk-away automation while retaining the speed and simplicity of EasySep™ with as little as 5 minutes of hands-on time.